Time is a huge hindrance for me. Between going to school full-time, working part-time, and keeping up with social demands, finding time to sit down to write can be seriously impossible! But thankfully, it doesn't have to be impossible. Over time, I've managed to discover a few tips and tricks that help me continue writing, even with a busy schedule. 1. 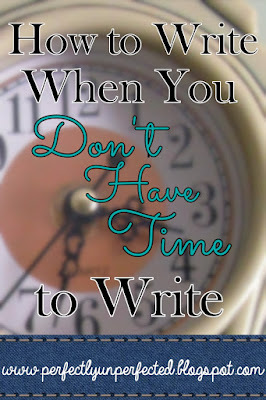 Set a specific time to write. It doesn't matter how long you write for--5 minutes, two hours, who cares. The important thing here is to set a time slot aside and completely dedicate that to writing. If you're going to keep up with your writing while also keeping up with a busy schedule, then you have to treat your writing time like a job. 2. Take advantage of every free moment. Have a break between your classes? A half an hour before you have to leave for work? Ten minutes when you first wake up? Take advantage of your free moments. I personally like to write as much as I can in the half hour between my morning class and afternoon class. You'd be surprised at how many words can be written in just thirty minutes. 3. Just write. Don't worry about grammar, spelling, cheesiness, etc. You can go back and edit everything later, once you have more free time. But for now, just focus on getting as many words down in the time that you have. 4. Bring a notebook with you. Just because you don't have your laptop and/or story in front of you doesn't mean you can't write or get writing work done. Carry a notebook with you so you can write down ideas as you go. If you have a free moment in class (or you're just bored/zoning out) jot down ideas or plot. But hey, if your grades slip because you're not paying attention, don't blame me! 5. Lower your expectations. If your life tends to be busy, don't set unreachable goals for yourself. Trying to hit 20,000 words a week is probably not the best goal if you go to school and work and have a social life. Instead, try setting smaller, doable goals for yourself. By all means if you like a challenge, then challenge yourself! But for those like myself who get stressed out when they don't reach their goals, a simple 100 or 200 words a day goal is probably the better way to go. So there you go. Five simple ways you can write without having time to write. As this semester continues, I'm sure I'll find even more ways to write with a busy schedule. In the meantime, I hope you all are having a great start to the new school year!